Gaps between individual panels and acrylic lenses embedded in the concrete create a lively play of light and shadow. Photo by Casey Dunn. 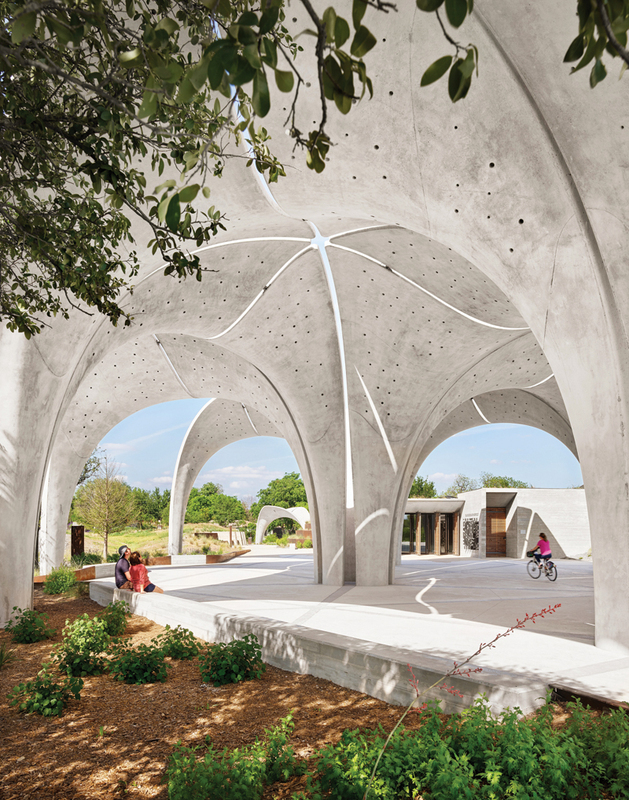 A sculptural ​pavilion made of 17- and 26-ft-tall concrete panels marks the confluence of ​ San Pedro Creek and​ the San Antonio River. Photo by Casey Dunn. 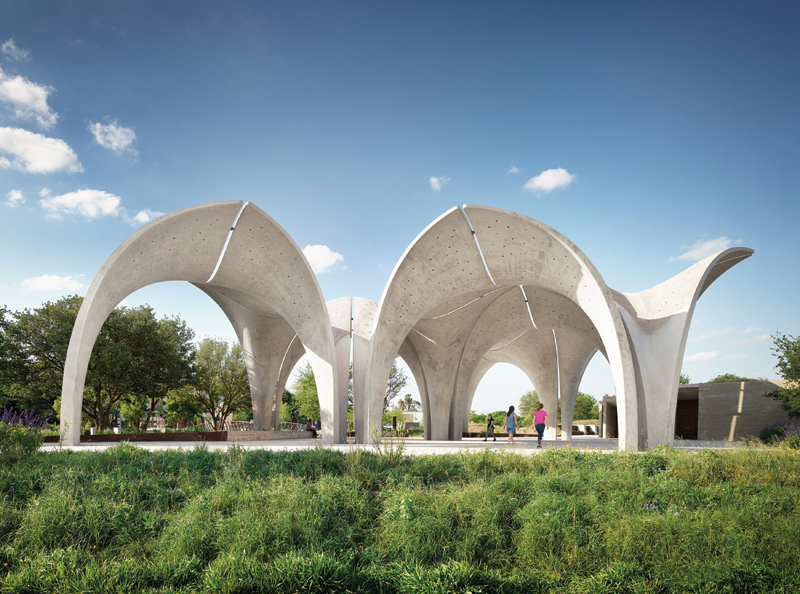 The concrete petals of Confluence Park are a new landmark along the Mission Reach of the San Antonio River. Photo by Casey Dunn. 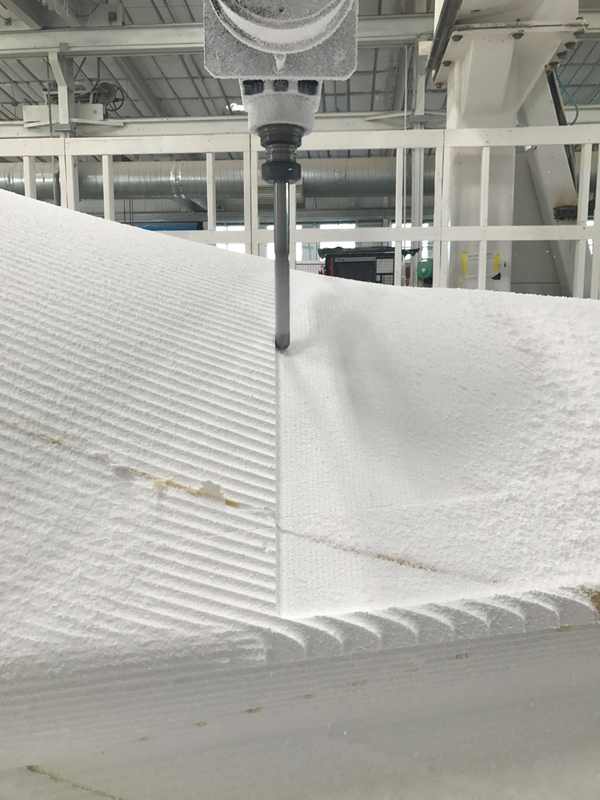 The ​ ​fiberglass formwork for the concrete panels was formed over Styrofoam “positives” ​milled directly from digital files. Photo courtesy Lake | Flato. 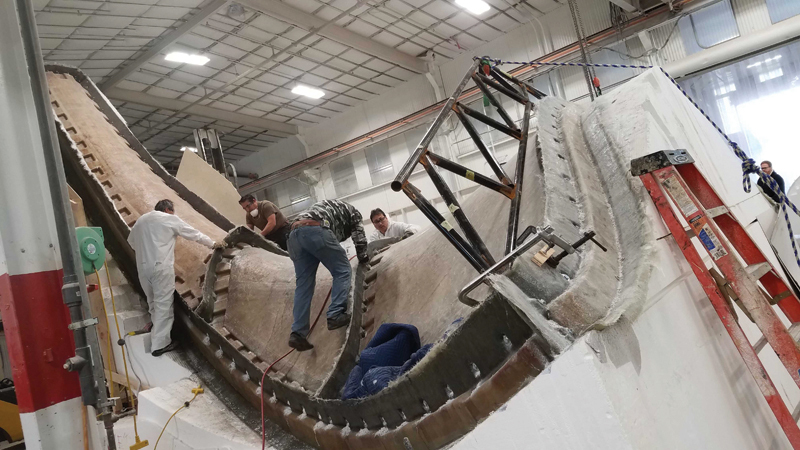 A large 5-axis CNC router built for making yacht hulls was used to create the complex curves of the Styrofoam “positives.” Photo courtesy Lake | Flato Architects. 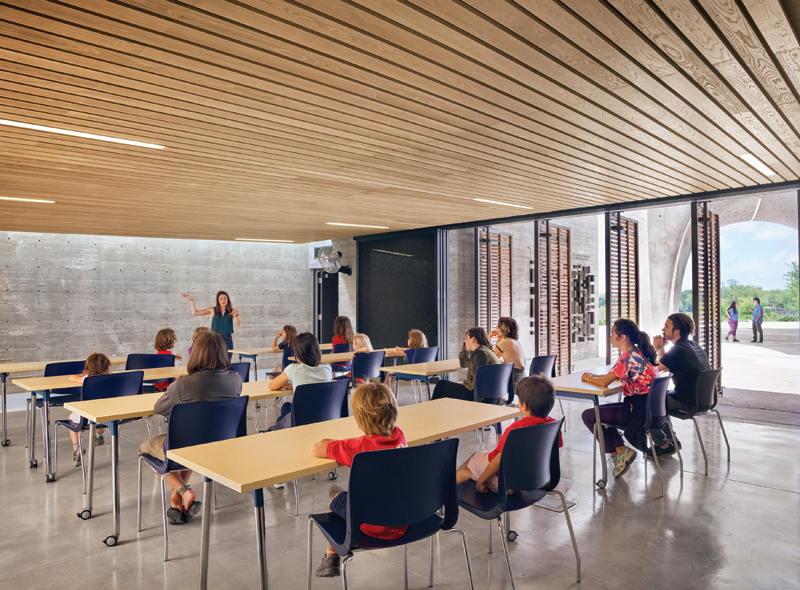 A multi-purpose education center serves as a classroom space with large windows that open up to the pavilion. Photo by Casey Dunn. The education center features a photovoltaic array and a green roof that provides thermal mass for passive heating and cooling. Photo by Casey Dunn. As implied by its name, Confluence Park overlooks the meeting of San Pedro Creek and the San Antonio River. 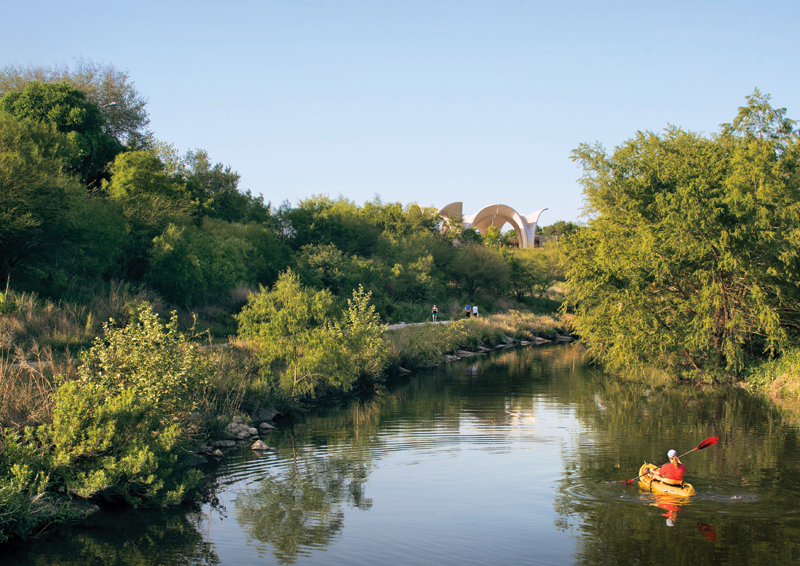 Located about three miles south of downtown, the park acts as a gateway for the historic Mission Reach section of the San Antonio River. The $13.7 million project includes an education center and extensive landscaping that illustrates the diverse biomes of Texas. But what most visitors will remember about the 3.5-acre park are the concrete petals that emerge from the ground to form a sprawling overhead canopy. Twenty-two of these sculptural panels, each 26 ft tall, are clustered together to form a single large open-air pavilion. Another six, each 17 ft tall, are paired to form three smaller gathering areas. 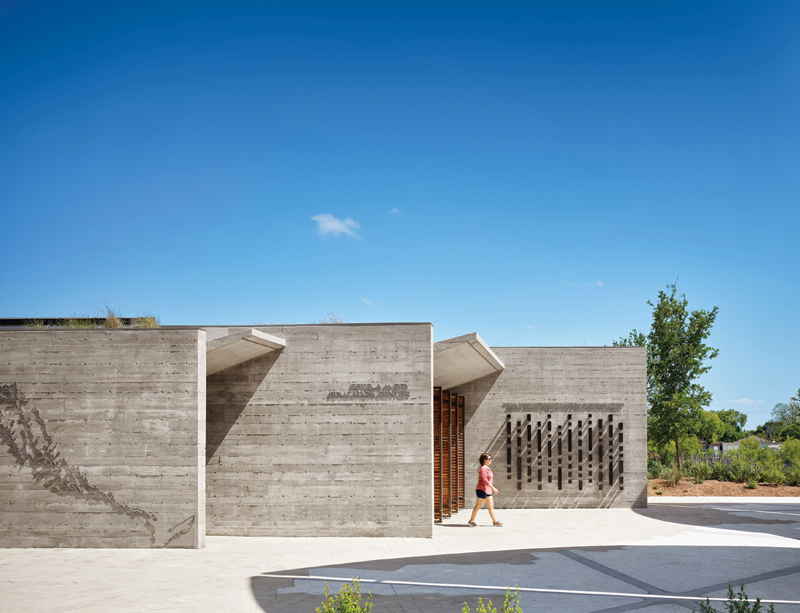 As well as providing relief from the South Texas sun, these panels are shaped to channel rainwater into an integrated collection, filtration, and dispersal system. This all reinforces the stated mission of the park, which is to act as a destination for learning and recreation while teaching important lessons about environmental science and sustainability. To that end, the design team sought to create a composition of architectural and landscape elements that used the same kind of logic found in nature. Ball-Nogues Studio, a Los Angeles-based design practice, established the park’s conceptual master plan. From there, the design developed in close collaboration among the landscape architect Rialto Studio, Lake|Flato Architects, and Matsys, a San Francisco-based design practice that specializes in the development of new approaches to the design and fabrication of architecture. That particular skillset was critical in the development of the park’s iconic concrete panels. Given the structural gymnastics involved, the project’s structural engineer, Architectural Engineers Collaborative (AEC), became an integral part of the design team, as well. Although petals of steel, fabric, and wood were all considered during the design process, concrete was ultimately selected for its durability and permanence. Even though the majority of funding for the project came from private donations, Confluence Park functions as a public park, and so vandalism and long-term resiliency were key considerations. Despite the apparent complexity of the assembled petals, the design only required three unique petal shapes. These three forms were refined digitally using Grasshopper and Rhino. The resulting computer files were then provided to Kreysler & Associates and fed to their large 5-axis CNC router at their factory in California. The resulting Styrofoam “positives” were then used to manufacture the fiberglass “negatives” that were shipped to San Antonio to be used as formwork for the petals. Each of the park’s 28 petals was cast on site but not in place. Given their complex geometry, a portion of the petal had to be exposed during the pour. This resulted in two contrasting concrete textures: a smooth finish where the concrete was poured into the fiberglass form, and a broom finish where the concrete was left exposed. As with many other aspects of the project, a custom solution was required here, too. A wire bristle broom, cut to a width of eight inches, was used to apply the finish consistently to the petal’s curved form and to emulate the flow of water down the petals. After the concrete had cured for several days, the petals were lifted into their final positions. As with any tilt-up concrete structure, this was the moment when the highest stresses would be placed upon the petals. Adding to the complexity of the erection process was the fact that the petals had to be assembled in pairs: Neighboring petals were joined to one another with two steel pin connections to form a determinant structure. The result of all this effort is a unique landmark on the south side of San Antonio. 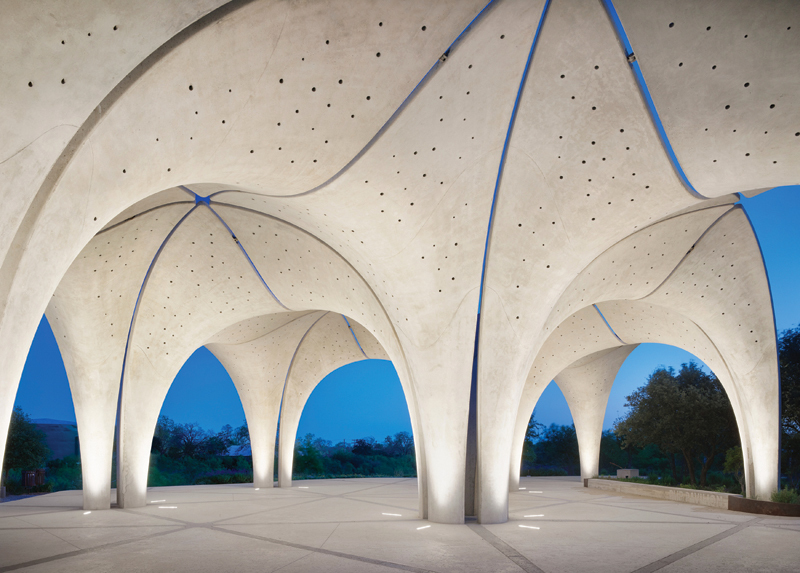 Despite the weight of the concrete petals — between 12.5 and 20 tons each — the resulting structure feels light. The space between petals contributes to this feeling of weightlessness, while acrylic lenses embedded in the concrete add playfulness to the composition. In addition to illustrating the possibilities of contemporary concrete construction, Confluence Park demonstrates what is possible when a highly collaborative interdisciplinary design team works with an educated client to create something truly unique. It is only fitting that a park built to celebrate the confluence of diverse bodies of water be created by a confluence of diverse design professionals. Thank you for your commentary on the project. You have beautifully captured the essence of Confluence. And yes the structure is determinant, part of the structural logic for the design. As a determinate structure, the forces and moments within the petals can be understood with greater certainty.